Provincial Dental Fee Guides are established by provincial dental associations and used by most dentists to set the rates they charge. 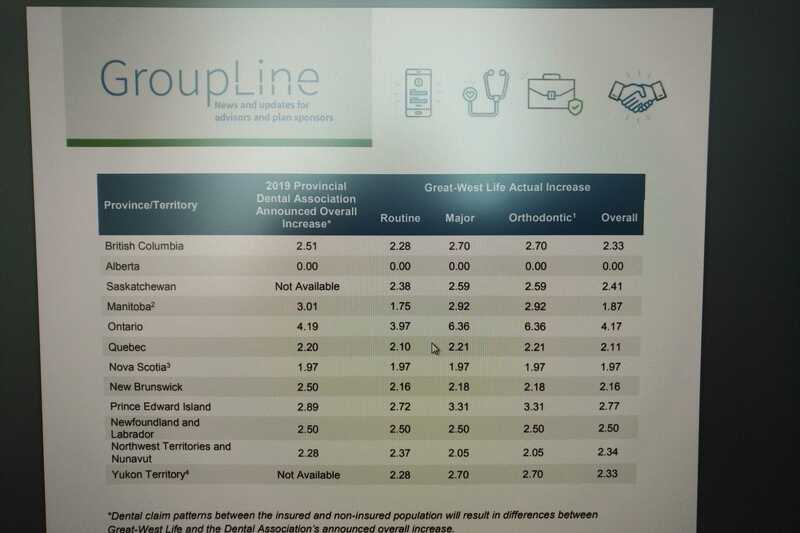 Insurers use them as a guideline to avoid dentists overcharging above beyond this “Reasonable and Customary” limit..
Ontario is seeing the rate increase 4.19% this year. This means that the same service you had last year, performed by the same dentist will cost (on average) 4.19% more. On top of this there is trend and utilization (these are the amounts that we go to the dentist more often and use more services.) that will further drive up the costs that employees are charged and that benefit plans will be paying. This increase is double what we have seen in past 20 years. I have spoken to the ODA and they are saying that a large part of this is due to the new “Infection Prevention and Control in the Dental Office” regulations that have been enacted, which has required dentists to invest in office equipment and process upgrades. The ODA goes further to say that this is only the start and that 2020 may hold the same type of increase again. This will be a huge driver of rising dental claim costs as we progress through the year. The tables will be published by insurers in the coming weeks. If you want to see a quick copy.